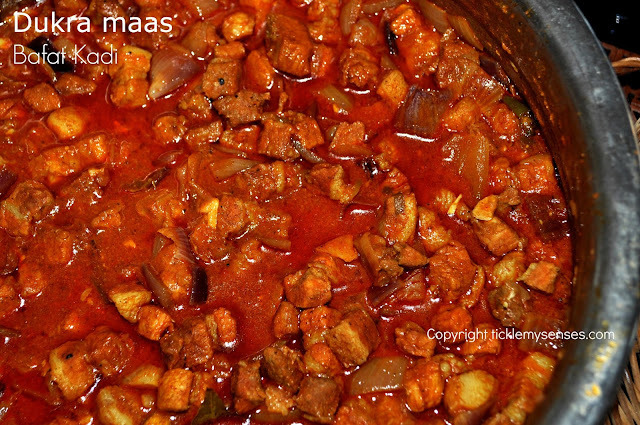 Pork Bafat, DukraMaas is a wonderfully spicy and flavourful hot traditional Mangalorean Pork curry. This is a speciality of Mangalorean Catholic households, prepared on special occasions, served most often with Sanaas ( soft steamed rice dumplings) or bread buns. 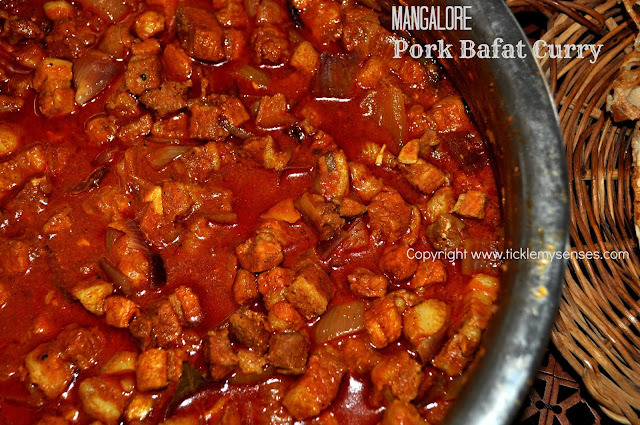 All Mangalorean Catholic families have their own special recipe for making this dish, one that has been handed down for generations from grandmother to mother to daughter. This style of cooking pork is one of the simplest and tastiest I have ever had, I have learned to make this from my mom, who i believe makes the best Bafat. 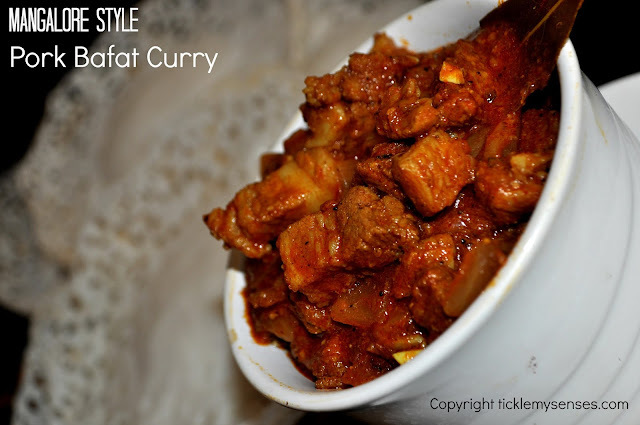 The combination of spices in this preparation gives the pork a unique hot, spicy and tangy flavour. Ready made Bafat powder is available in Mangalorean food stores, however the freshly ground paste gives this dish a completely different dimension and flavour. The Portugese love for pork surely reflects in the Mangalorean cuisine as this meat is truly relished and prepared in a variety of styles like Sorpotel (the goan variation of this dish which includes spare parts like liver, heart) , Kaleez Ankiti, Pork Indad, Pork Pepper fry and Pork chilli. I have used pork loin in this preparation as the meat is tender and much leaner. Turmeric: 1/2 tsp- do not roast. 1. Cube cleaned pork into 1 inch pieces. 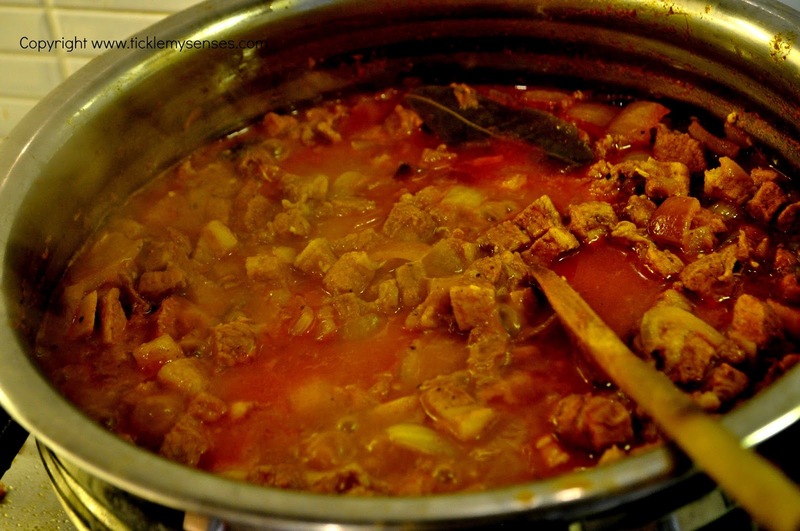 Add all ingredients to cook the pork in a large thick based vessel ( traditionally made in an earthen pot) with 2-2.5 cups of water and cook closed on a medium flame till pork is tender and done. 2. In the mean time prepare the slicings, slice onions( slightly thick) ginger and garlic, slit green chillies. 3. Roast all masala ingredients seperately till aromatic. Put in grinder with a 1/2 cup water and grind to get a smooth paste. 4. Add the ground masala to the cooked pork, add tamarind extract and 1/2 cup masala water ( adjust more/less water to get the right thick gravy consisitency) . Cover and bring to a boil. 5. Add all the slicings, give a good stir, check for salt, and cook on a medium flame covered for around 7 minutes or more till onions turn soft. Add vinegar to taste. Sprinkle over garam masala powder. Turn off. Yummy Bafat Dukramaas is ready. 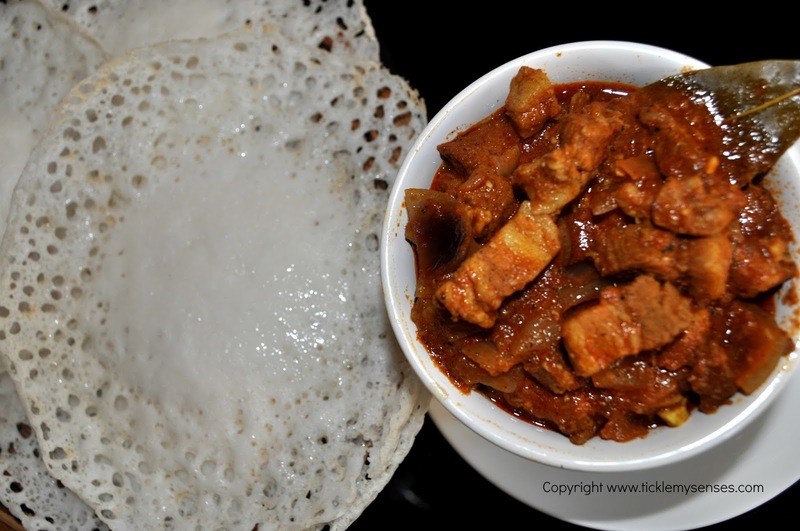 Serve with freshly steamed sanaas or the traditional way with bread buns or with lacy Appams. The taste of the dish improves with time and reheating. It looks very yummy. 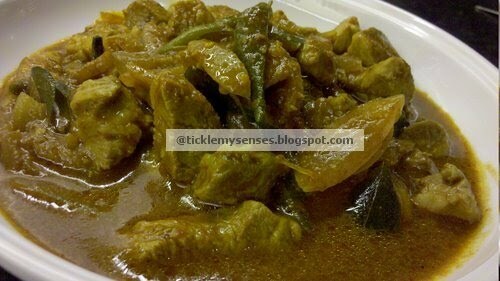 Instead of Pork can we make this receipe with Chicken & Mutton. Looks Yummy----Thanks for sharing this Receipe. you are welcome vincenaina...hope you relished it. wow keegan ....im impressed...youve been cooking! !.......im glad you enjoying the recipes!! Carol, I thought that I made a good Pork Bafat until...I stumbled upon your recipe. After a quick glance, I decided that this is a " must try' and an interesting variation from the one I made. I wasn't wrong. The Bafat was a hit, especially with my son who also happens to be my food critic. I am definitely going to try your other recipes . Have already shared your blog with my sis. Thanks for the recipe. PS: You have an interesting blog with creative visuals. Carol, I thought that I made a good Pork Bafat until...I stumbled upon your recipe. After a quick glance, I decided that this is a " must try" and an interesting variation from the one I made.